Join Yuki Teikei Haiku Society. 2010 Asilomar Haiku Retreat. 2008 Asilomar Haiku Retreat. 2007 Asilomar Haiku Retreat. Published haiku by J. Zimmerman. Concrete. Ghazal. Lai. Pantoum. Rondeau. Rubáiyát. Sestina. Skaldic verse. Sonnet. Terza rima. Triolet. Tritina. Villanelle. 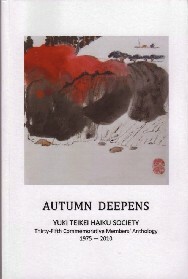 Yuki Teikei Haiku Society, its GEPPO magazine and its annual anthologies. How to join the Yuki Teikei Haiku Society. How to subscribe to the GEPPO magazine for the study of haiku. How to buy an annual anthology of the Yuki Teikei Haiku Society. The name is Japanese: "Yu" means "having", "Ki" means "season", "Tei" means formal", and "Kei" means "pattern". Therefore, "yuki teikei" haiku have a season word and follow the 5-7-5 pattern of syllables. Founded 1974 by Mr. Kiyoshi and Mrs. Kiyoko Tokutomi, to foster writing haiku in English along traditional (Japanese) guidelines. A newsletter is published bimonthly (every two months). An annual meeting is held; Several other meetings occur during the year. He presents their lives, their prose, and 300 of their poems. The Haiku Seasons: Poetry of the Natural World by William J. Higginson. Books of Poetry Form. Alphabetic index of poetry forms and related topics. How to Write Poetry.